The first Swedish antique piece we purchased was a Mora clock. My partner, Tom, and I discovered one while on holiday in Sweden. We were in the elegant neighborhood of Östermalm, Stockholm, and noticed, in a shop window, a very shapely tall-case clock painted in the palest shade of dove-gray. 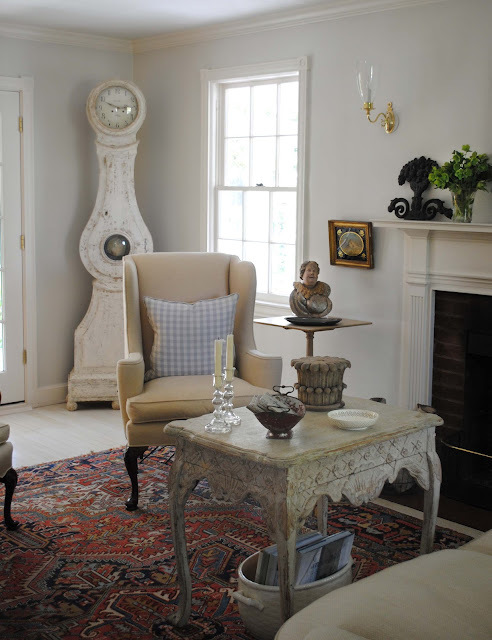 We fell in love with the clock, and had it (along with a sideboard and secretary) shipped back to DC. What is a Mora clock? Without getting overly technical, it is a form of a grandfather clock. The ones I love are painted and curvilinear, designed to resemble the female form. Many were made in the town of Mora, Sweden - especially by farmers and their families during the long Nordic winters as a way to supplement income. Over the years, I have sold many Mora clocks, and each one is unique, distinctive, and quirky in its own way. 2 Mora clocks in my shop. 3 of my former clocks, each with distinctive hood ornament. Left: glazed spy hole. Center: Neoclassical urn finial. Right: stylized headdress. 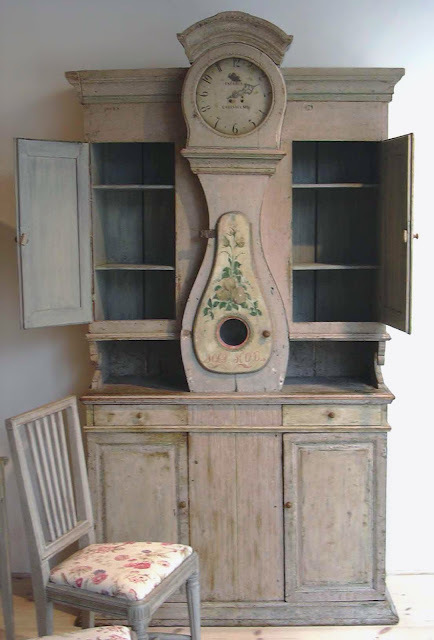 I wish I had kept this elegant clock which had been hand scraped to almost bare wood. 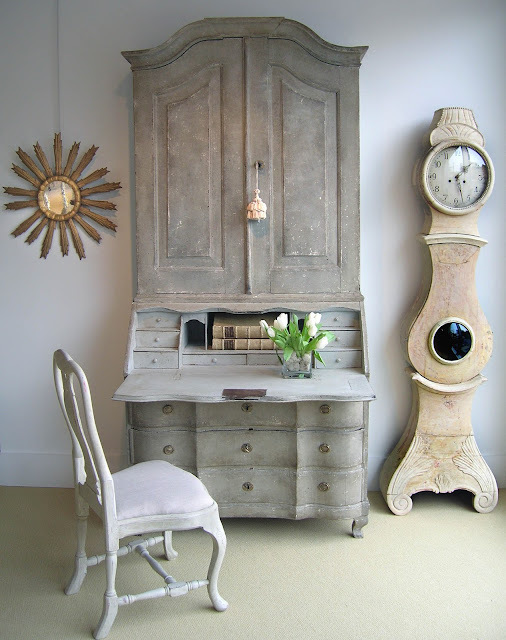 It is next to a Gustavian tea table. This indigo blue clock is now at a beach house. Hello, old friend! 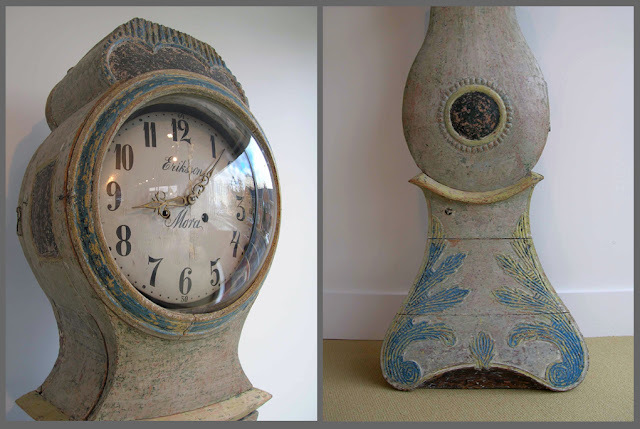 Top left and below: one of my earliest clocks dating to the Rococo Period (Ca. 1780s). 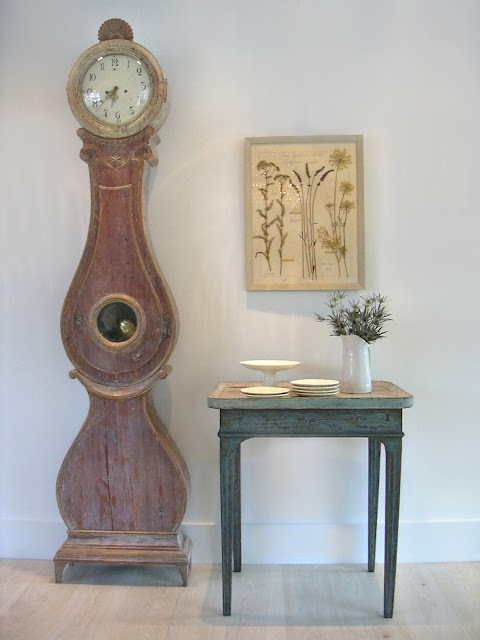 Above and below: 2 vignettes from my shop - both clocks have sold! This very rare clock cupboard went to a collector. Below are photos showing clocks at home. They look lovely in corners, foyers, living rooms, etc. Above: a tall and narrow clock from Northern Sweden in our living room. Below: this clock in our family room does not have a hood ornament. And, its plinth base is quite exaggerated. This clock was in Linda's former home. Photo by Lydia Cutter from Home and Design magazine. The clock in Michelle's living room has a base drawer and bun feet. Brook and Steve Giannetti's clock in their foyer. See more in Patina Style. 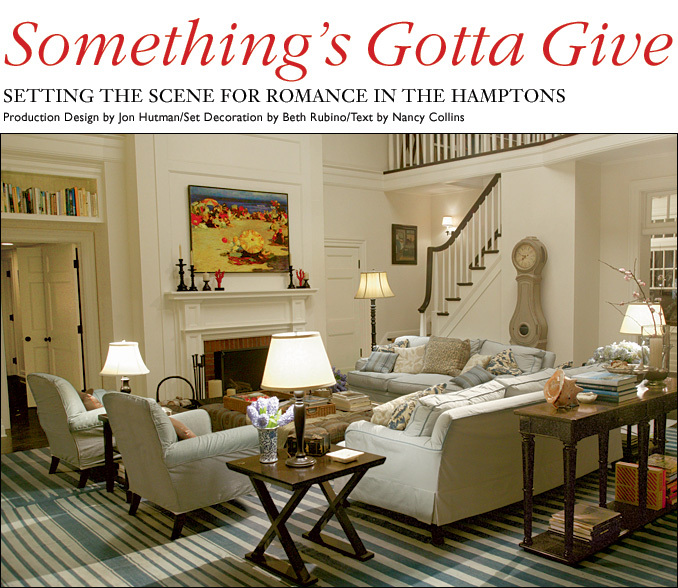 Lastly, the living room from the very famous movie set of Something's Gotta Give. Image via Cote de Texas. Hello Loi, Now we know what these are called, and what a range of subtle forms and colors they come in. The body shape reminds me of several instruments in the violin-lute-guitar family, which are also said to resemble the female form. I also see a more fanciful similarity to Munch's The Scream, in the overall shape, and the way the wood surrounding the clock's face resembles the hands in the Munch painting. Is the section below the pendulum window just a cabinet, or is there some function to it? I don't see any doors--do those base sections open? Hello Loi - I have long admired the shapely clocks from Scandinavia but did not realise that they were correctly called a Mora clock. Thank you for describing their history and how they were made during the dark Nordic winter months, somehow that adds even more intrigue to them. As usual another beautifully presented post. I am truly in LOVE. I have always loved these clocks, with their shapely curves and soft patinas. But now I know their name and a little more about them. Each picture was more beautiful than the first, Loi. I really don't know how you can have a shop of such beauties and sell anything??? I would be a disastrous shopkeeper.....because I would KEEP everything. Thanks for such a lovely post. Happy Labor Day Weekend, friend. Thank you so much for enlightening me to these beautiful pieces of "ART"! The fact they are also functional only adds to their appeal!!! The story about the Mora farmers constructing them during the long Nordic winters was something I never knew. I now appreciate them so much more. I always felt their shape was unique. The examples you pictured were lovely, the ones in your home.... outstanding! I do remember the one in the movie Something Has to Give....by the way one of my favorite "spaces"!! Someday I would love to have one in the Bucket List House. I am sure I could move things around and find the "Perfect" spot! It will be an item I will add to my wish list! Thank you for this post, Loi. It was such a great and interesting piece! I can see why you and Tom originally fell in love with these beautiful clocks. I would take any one of them, and it must be so hard as a shop owner for you to part with each piece. I especially like the circa 1780's one with the beautiful touches of blue...really lovely! I hope you are both enjoying your weekend. I have always wondered how a Mora clock would look in my living room (on the small wall next to the windows where I have 2 small paintings now. Opposite from the wall with the column). What do you think? These are on my current "envy" list & my someday "to own" list. Beautiful post! What a wonderful post. The photographs are so beautiful. I can understand why you fell in love with that clock. It is very elegant and beautiful. I do love the color of the clocks. Thank you for the great lesson. Ahh Loi, I was so waiting for this post. I knew you would one day write about Mora clocks. All of these are beautiful. One day, I have promised myself, I will own one. Hope you had a lovely weeekend, Loi. Oh my... I can't tell you how much you made my night!!! I LOVE these clocks!!! My favorite piece in my home is my Mora. You're store is so dreamy - I would be like a kid in a candy shop walking through your store! Thanks so much for showing us all your beauties! It would be so hard to let go of such charming pieces, but how nice to bring beauty to so many! Hope all is well my friend! Love Mora clocks. I would love to have one. The patina on some of these are amazing. I do have a antique pine clock from the 1800s that I love. You have so many wonderful things in your shop and your home. Have a great weekend. I absolutely love Mora clocks, they are so beautiful. I do wish I could have one one day. But I don't think I can get any here in my country... Sigh. Who knows, maybe I'll have the chance to visit Sweden in the future! Oh! They are so delightful and seeing your photos of them is like seeing a collection of long lost friends into the past...they are all distinctive, aren't they?! 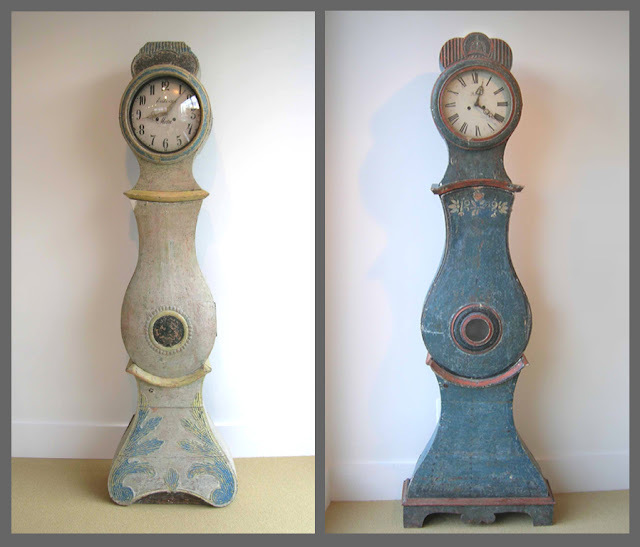 Hi Loi - I just ADORE these clocks! I've been secretly pining for a Moro clock for a number of years now. I love their elegance, their shape, their subtle colours and patina. Luckily Mr. Sutton shares my love for them, so hopefully (fingers crossed) when the right one comes along, it'll be happily making it's way into the arms of Hill House! Beautiful images as always - when will you write/photograph that book?!!! Too excited oggling the eye candy - that should read MorA clock!! oh Loi - so dreamy . . . I reeeeaallly want one of these clocks so badly! I LOVE them! Everytime I see one I think of you :) I've always liked them but it was when I saw a photo of the hallway in your last home with the clock that made me want one for my own hall. I will get one some day - in the meantime I'll drool over your beautiful photos. The patina on these pieces is just so beautiful - I love the one that you wish you had kept too - she's a beauty alright! sigh! never mind something similar will come along one day . . . and I will never get tired of looking at photos of the Something's gotta give house! LOVE! Love, Love, Love Mora clocks. I think it's the 'chunky - ness' of them! Does that make sense? I'm lucky to actually own one, which was definitely bought for its looks not its time keeping! Which I've lined up for an appearance in a future post. As usual though, your post is way more informative and beautiful than my snippet of an idea, so for the mean time, I' m just happy to ogle your lovely images. A few years ago, I was on the hunt for a good mora clock, then we decided to build a house and I put all interior design of my former house on hold. Now, in the new house, there are several spots that would be great for a nice mora clock, and my color scheme and style would certainly work well with the elegant beauty of a mora clock. We will see - I am doing round 2 of interior design in 2013, so will talk with my designer about it! 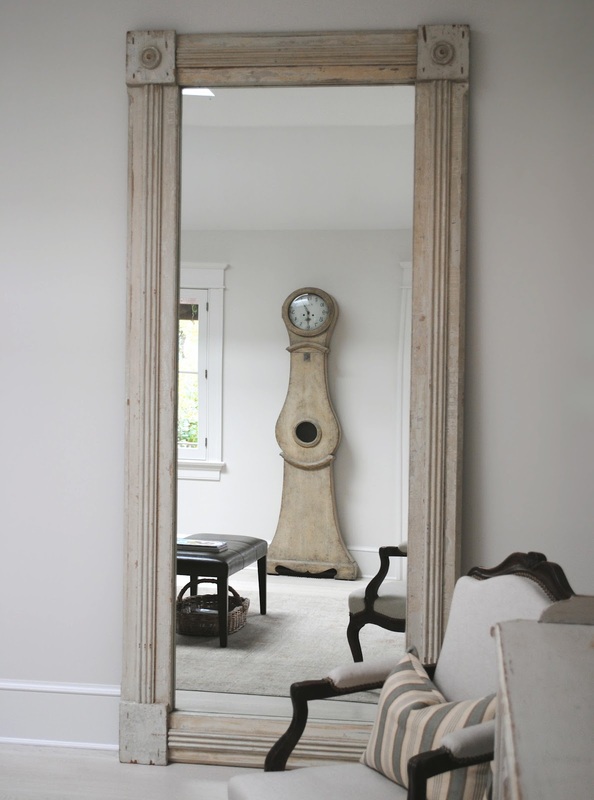 Here is one of my all time favorite pictures of a mora clock, in an interior by Suzanne Kasler - http://bit.ly/OHz4Pc - when I wrote up a profile of this house for a tour of homes, I was disappointed to see that the clock was brought in from the designer's collection, it is not part of the home decor. It seems so perfect for the space! Ps: forgot to say your shop looks divine. Could you open one in London please? They always remind me of a more slender and simplistic versioheld the French Boulle clocks? The Swedish are experts of simplifying design and always for the best. Such clean lines. I love this look. Loi, you would have loved where I went on the weekend in London. Have you heard of the Wallace Collection. A must for your next visit to London. Antique heaven! Enjoy your free Monday, what will you be doing? It is wonderful to get a history lesson along with a gigantic dose of beauty here! 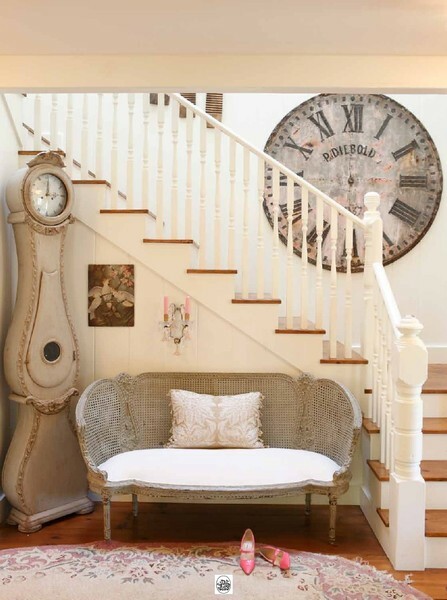 I adore these clocks, and each image is gorgeous. Hi Loi, I have always wanted a Mora clock and now more than ever, but I have to find one with proportions small enough to suit my little Vermont house. As always, the photos of your shop are beautiful and inspirational. I am starting to think you should do a coffee table book. Hope you and Tom have enjoyed the long weekend. I always loved the approach of fall in DC. It was such a relief. Dear friend, this is a great post and history lesson. We have been noticing and coveting the Mora clock for years now. I love all the different hand touches you have shown as if they were signatures of the maker. You should do a book as Phyllis suggests- your home and store are every bit the professionally curated and perfectly acquired source of Swedish Antiques! Love everything you post! The Swedish Mora clocks are a delight to study and compare! It's so interesting to see how such subtle differences in design can cross the line between country charm and sheer elegance. To my mind, the convex glass lends a lot to the success of particular designs — but — I love them all! A great posting, and yes, you really have all the elements for a wonderful book. Lindo essas antiguidades, amo relógios. Eles trazem consigo um pouco da historia e do tempo passado. I have wanted a Mora Klocka for going on 30 years now (since my teens)...once my children are out of private school, I will finally have some disposable income and securing o e with a lovely crown ornament is at the top of my wish list! I would love to see a coffee table book of photos of the hood ornaments alone. They're all so different and interesting...and beautiful! Loi I of course have seen many Mora clocks; however not taken the time to really notice the fine details, top ornaments, and shape designs! My dream is certainly to have one soon! Although, I have never been a "clock person", now I know what to look for in the details. Have a wonderful day!! Really beautiful photos here! My favorite clock is the one that was scraped to bare wood, I love the color and shape, really beautiful:). I loved seeing peaks of your shop in the photos too, it looks lovely! Gorgeous Post ,I love your style and all you share. I am new to your blog, so pleased to be sent to you by Sharon from Roses and Rust. Looking forward to follow along and and add your blog to my must visit list of blogs! Very interesting Loi! I had never heard the history. Now, when I see one....I imagine the shape of a pretty lady. Maybe I'll find one someday that I can afford. Nice post! I am in love with Mora Clocks!! Every piece is so unique!! And I enjoyed all of the pictures here today!! Interesting and beautiful post as always! 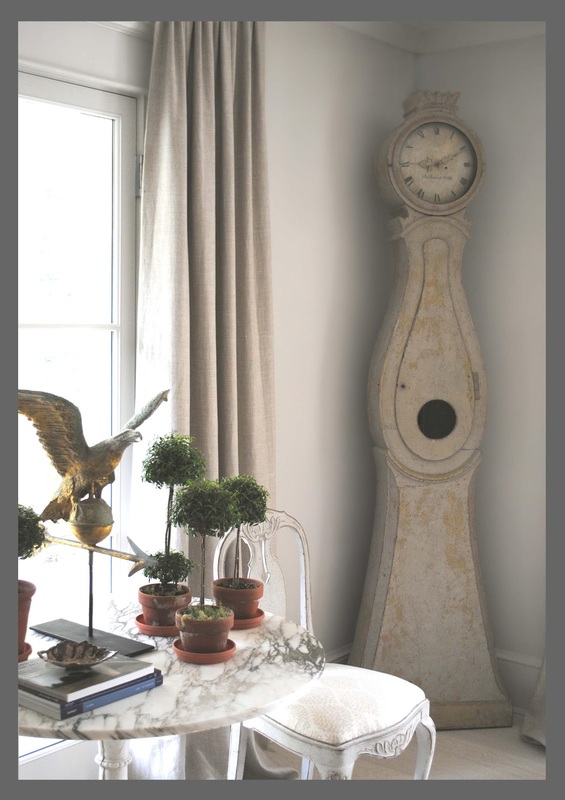 The Mora Clock is certainly very suggestive of all things Swedish and definitely adds a focal point of interest in any room in which it is placed. You show some wonderful examples here, all of which suit there surroundings most beautifully. We have discovered your most stylish blog quite by chance and are absolutely thrilled to have arrived.Your attention to detail is highly professional and the posts are intelligently written. We have signed up immediately a Followers in order not to lose touch! Thanks so much for your visit. I enjoyed your tour of Venice. I have always been intrigued by the shape of these clocks and I never noticed the wide variations in the details. That was a fascinating lesson! I loved analyzing each one and have never seen such a beautiful group of Mora clocks together. Each one as pretty as the next. Your shop is so full of beauty, your customers must have problems deciding what to take home! 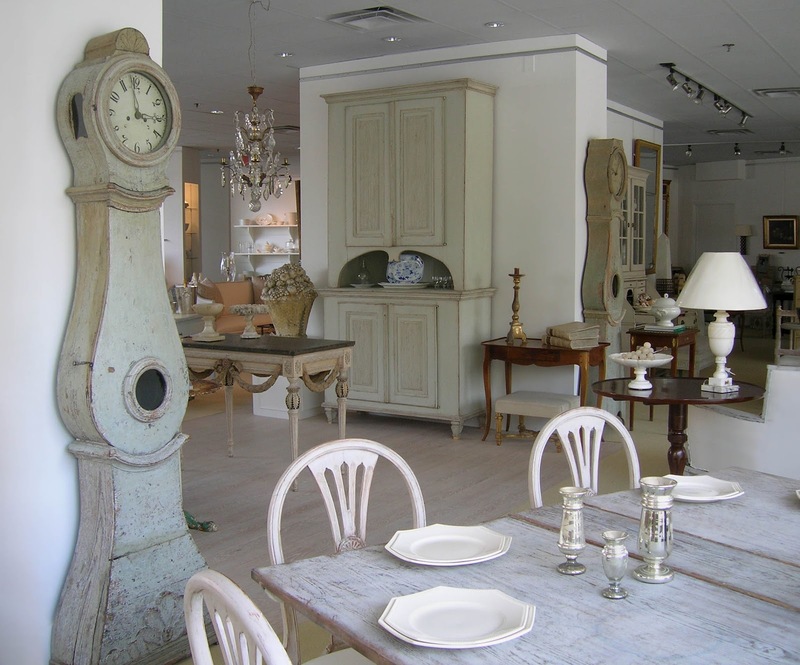 Hope the world knows by now that you are the source for elegant Swedish antiques. i feel such a connection with them. my parents have one. but i am most enraptured by your stunning styling and photography. quiet hushed tones. the chalky timeworn lovely of it all. dreamy as the sweetest dream. thank you for sharing your shop and home generously as you do, loi. This is fascinating! I loved getting to learn about Mora clocks. And I have to say that your store is absolutely beautiful, Loi! Working amidst such beauty must make for a lovely time at work. Mora clocks have an annimated look about them yet they're very understated. I think they used to be in some children's cartoons also. These clocks look great in many settings and always appear to be saying something. Love them and Thank You for sharing a bit of their backgournd. Love the snaps. Surely a clock which would enhance any setting in the home. One day, maybe, if I am a very good girl. I agree with Mrs Sutton, if we can't have a shop in GB perhaps a book might stop us pining as much. Oh my! So very, very gorgeous! I had to look at the pictures really slowly but the blue one made my heart stop anyway! Learnt a new word today, too - mora. mora...mo-ra. got it. These Mora clocks are so beautiful, each one a piece of art. While I love them, what really caught my eye in the first image was the light wood table with dark top, Louis XVI style legs and Della Robbia wreath ornamentation around the apron. That table really makes my heart sing. Your shop has so many beautiful, well-chosen items. One day I hope to visit. Best to you, Loi, for a great week. This Clocks! hummm Wonderful Homes Loi! your Images fantásics my Friend! You are such a wealth of information! I too have wanted a Mora for our home for many years! While on my hunt several years ago, I noticed how each one was so very unique,their shapes, coloring's are all so different...so very beautiful! Thank you for sharing your knowledge with us and for the amazing pictures of your shop and home! I am absolutely in Love with Mora clocks. They are all so beautiful. I dream of owning one someday. Thank you for this post, I am saving it. A feast for the senses! I love the vingettes in your shop! I love that each showcases the lines of the furniture and yet is a work of art in itself! I concur with all of the other comments, this is a wonderful post on the Mora clock and you have been lucky enough to have many fine examples. I LOVe the one that you commented that you wish your would have kept. And I would like to know if you would share, has there been any other pieces that you "let get away"? Have a great week! I hope you find a little time this week for a day off of reading and relaxing. Such beautiful treasures. I am always amazed how graceful these clocks are. We have three grandfather clocks in our home the oldest dating from the 1790's, I love walking by them throughout the day, seeing them as the shifting light plays around them. Thank you for such a inspiring post. As always, I leave your blog motivated and refreshed! Loi, time has never looked so beautiful. I really enjoy the history behind the pieces. The vignettes are divine! I love that you seem to have a relationship with each piece. As for the hood ornamentation...I love them all! I could see how someone would end up with a house full of these clocks they're gorgeous! You're killing me here showing your shop all I want to do is jump in my truck and drive down to load it up, you have such amazing taste. 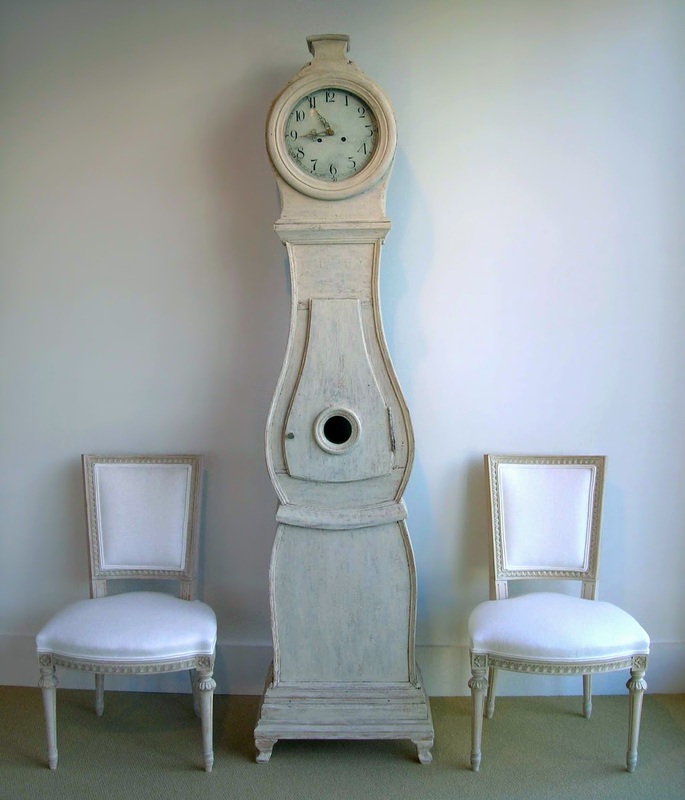 Isn't it incredible that simple craftsmen made these clocks during their down time in the winter? I should be so industrious during our winters. Like you I miss certain pieces when they leave me but I'm happy when they find a new home. Enjoy your week! I felt so sad when I read, "Hello, old friend." It must be so difficult to sell the things that you love. After all you found them, had them shipped home, displayed them beautifully and then had to sell them - sort of like training a helper-dog for a year and then giving them to the new owner who needs them. I am glad you posted about these clocks. I learned what I did not know - the roots of Mora clocks and how to display them beautifully. Thanks, "old friend." 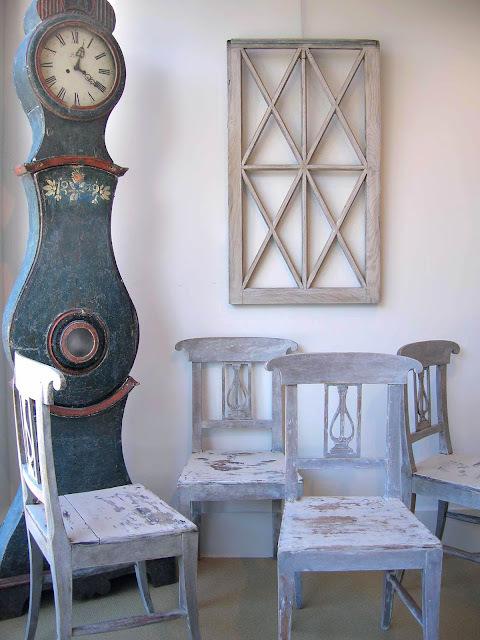 I just love these treasures and those mora clocks are so beautiful and gracefull. Time only makes them more beautiful and we just have to cherish and love that. You have a great eye for beauty! Such amazingly beautiful clocks! And what a lovely shop you have. It would be such a treat to visit! Absolutely gorgeous Loi. I don't think there is room in my home, and that is probably good because the more I see them the more I want one. How difficult it must be to part with these - each one is exquisite, as is everything in your wonderful shop and home!! Loi, when we lived in the UK, I would see these at flea markets and antique fairs. At the time, I was too stupid to pick one or two up. Oh, If I could go back, I would shop so differently! Love all of your images. They are all sooooooooooooooooooooooooo pretty-the curved lines, the worn patina, and they tell time! Thank you for this Loi; I enjoyed learning more about these gorgeous clocks! They are so graceful and soft and the history behind them just adds to their beauty. These would be treasures in any home! 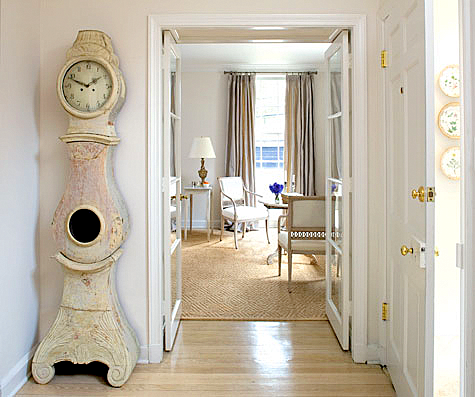 I have always loved these elegant clocks! Beautiful photos...My favorite shape is a circle, so I think I'm drawn to the flow of rounded pieces. Your home is so beautiful, dear Loi...a breath of fresh air! Have a splendid rest of the week..and thank you for the inspiration! Loi, thèse are absolutely gorgeous! There is nothing prettier to me than a grandfather clock…no matter the origin! I have a very early English one in our family room…I will never part with it! The Swedish clocks you shared with us are incredible! I loved each of them! I actually just passed up a clock cupboard and now am rethinking that stupid decision! Will keep you posted on it! The blue clock that left for the beach….I wish I was taking it with me in the morning! It would've been so perfect! Your taste is impeccable! I knew I loved you from the beginning…and now you just shared the pic from my ALL TIME FAVORITE MOVIE…. "Somethings Gotta Give!" I will only watch it about 50 times while at the beach! That's all i like to do and luckily my husband likes it as well! Loved this post and everything about it! I was so thrilled when I saw the title of this post. I own a Mora clock and it truly is one of the favorite things I have in my house. Thanks for the I site about the history of the clocks as well as sharing your always pretty pictures. I just might have to save up for another one some day! I love these clocks. I didn't know the name of them until now, thank you. Sadly, our home doesn't have a really good spot for one. They are very charming with each one having it's own particular details. Loi, you are always a font of information and style. Love these clocks and their variety. The presence of one of these clocks would be a big presence in any room. A classic element. Great photos of them in use! I can't get over the one with the neo-classical urn! For some reason, I have an aversion to having clock in my home. Maybe I was scarred by the ghastly 70s sunflower clock that was prominently featured in my kitchen growing up. The only one w/have is a digital one on the oven. My husband absolutely loves clocks - when we were in Austria he wanted to buy a cuckoo-clock and I didn't say anything...but he still didn't buy it. These mora clocks you've featured are beautiful. I love the feminine lines of the Mora clocks. Very enlightening post! Loi these clocks are beautiful and timeless. When I see pieces like this, I think about how they have been used by previous generations....obviously all eyes were on these! Thanks for sharing the different "settings"...I love getting a peek into how others have decorated with different pieces. Wish you were closer....I just know you'd have my perfect dining table! Oh my I have never seen so many amazing Mora Clocks!!! I am impressed at how you managed to let them go. Your home and shop are just exquisite Loi. Love your blog! 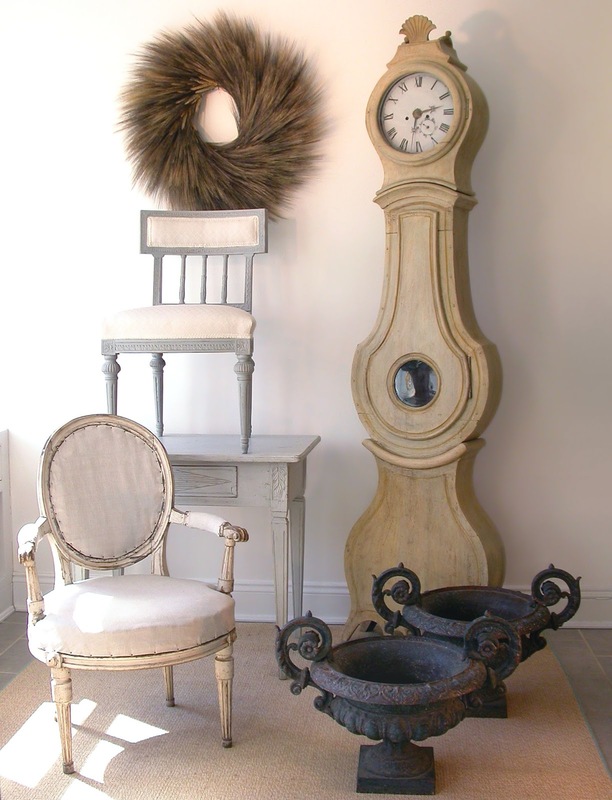 The Antique clocks look fantastic! The Mora range is certainly impressive! I have a Mora clock that is over 100 years old. It is square shaped looks like a castle on top. It was brought from sweden by my wifes uncle. How Do I find out what its worth? ?